Running is a social experience for me. It keeps me healthy and happy, while offering much needed stress relief from daily life! Grandma’s Marathon 2013 – it was a 26 minute PR and my first BQ! I felt amazing the entire race and was bursting at the seams with excitement after crossing the finish line. I was in Duluth completely alone since it was a last minute decision to register for the race, so the only thing that would have made it more perfect would have been to have my family and training partners there with me to celebrate. Someone once told me that I’d be a much faster runner if I’d just stop talking. I’ve learned that a big part of what keeps me running is the social aspect. I’m a happier runner when I’m sharing a run with others, which is why pacing is so appealing to me. 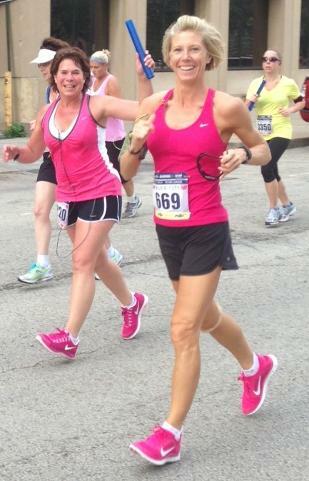 I enjoy being able to provide support and encouragement to other runners in pursuit of a goal. There’s such a great sense of accomplishment that comes with seeing another runner succeed. I’ll be your coach, your running buddy and your biggest cheerleader all rolled into one, and we’ll have some fun along the way! You’ve worked hard to get to the starting line. Trust in your training and don’t let the variables you can’t control freak you out. Most of all, don’t forget to enjoy the experience! I have been running and fundraising for the St. Jude Children’s Research Hospital since 2002. 2014 will be my 7th year participating in the Memphis to Peoria St. Jude Run.